Observation - Ground Beetle - UK and Ireland. Description: While planting trees this ground beetle was discovered. About an inch in length, purple iridescent edges to part of its back, very long antennae. Long strong back legs, with barbs on them. 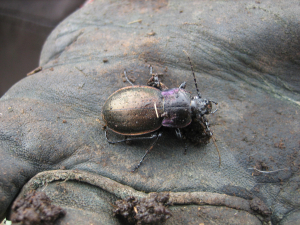 While planting trees this ground beetle was discovered. About an inch in length, purple iridescent edges to part of its back, very long antennae. Long strong back legs, with barbs on them.